A huge amount of quacking has occurred about the Duck Dynasty/A&E kerfuffle this week, where Phil Robertson has been suspended from his (hugely successful) show for speaking his mind about homosexual practice. And make no mistake – the incident has brought to the surface some huge, brewing cultural trends that need to come out in the open – even in such a stark and public way. Let’s not duck the fact that this is really about something far bigger than a group of offended folks, as important as that may be. So, let’s grasp the opportunity to get below the surface and expose the core of our culture war. Put aside, for a moment, Phil and his family, or the particulars about what he said and how he said it. That’s really secondary to what has actually been going on in our society for several generations. You see, the very same cultural disconnect is driving issues such as who uses which bathrooms in California. That state, always at the forefront of “progressive” thought, is seeking to enforce the notion that students may select their own gender for the purposes of choosing restrooms or playing on sports teams. I am not kidding. Choose-your-own-gender. And this starkly illustrates the crux of our societal divide. To put it very plainly – we are having to choose between gender as defined by God and/or natural law; or, gender as defined by the almighty self. In other words, we are wrestling with a societal push towards Gender Anarchy. Choose-your-own-gender. Choose-your-own-sexuality. Choose-your-own-behaviors. Subjective identity; subjective morality. Objective realities are so last century. Gender anarchy will, of course, manifest itself in a growing assortment of social and sexual behaviors. People on one side of the cultural divide will tend to believe in defined roles and identities and behaviors that transcend personal choice or feeling. Those who seek more personal/societal license will inevitably break down barriers in the pursuit of a more radical form of individual expression. Which will lead, of course, to the inevitable questioning of strictures against polygamy (also in the news), and an untold number of other sexual choices. Because, you know – right and wrong are shifting constructs. To put it another way – either a transcendent God has created us with clear and understandable gender identity and purpose, or not. Either we embrace an external standard of reality and morality, or we reject it in favor of personal subjectivism. This is binary. We can’t have it both ways. God = Accountability. No God = Whatever I can get away with. If there is no capital-R Right, then everyone may do whatever is right in their own eyes – choose-your-own-everything. And even though those who embrace such moral and sexual license will always try to qualify it with the idea of “consent” between individuals, that paper barrier never stands. Respect for others is rooted in transcendent values – it is not in the vocabulary of either anarchy or tyranny. Whoever is strongest and loudest wins, and the rest must be suppressed. Not accepted – suppressed. They stand in the way of the “progress” of limitless personal choice. And right now, in our culture, the cheerleaders for gender and sexual anarchy are on the ascendancy. Bye-bye, Phil Robertson. Shut up, Christians. Farewell, traditional morality. If you like your convictions, you can’t keep your convictions. Because your convictions offend those whose core conviction is self-determination. So, this is not simply about A&E and ducks. It’s not merely about toilets. It’s not primarily about this or that sexual behavior or preference. In fact, when you think about it – radical self-determination is not even just about gender. It’s about God, and truth, and objective moral reality. The rule of a REAL, objective, moral, sovereign and holy (yet benevolent) God, and the anarchic rule of man, are incompatible. Period. That’s why we’re at war over a duck-hunting, Bible-believing family. We’re accountable to God, or we’re adrift in a sea of subjectivism, subject to the whims of whomever has currently seized the reins of power. When we embrace radical self-determination, as individuals or as a society, we’re at war with God. We’re at war with each other. And we inevitably lose our freedom to the tyranny of majority opinion. Let’s not duck the real discussion here. This is about more than freedom of speech. 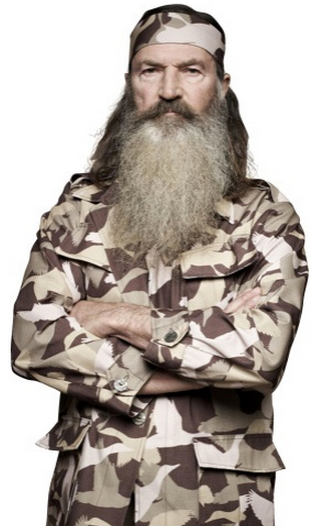 The Duck Dynasty blowup is a symptom of something far deeper. This is about God. It is also about the club of societal power, and who wields it. Liberty is from God (recommended reading for Anarchist-Americans: our founding documents). Or, freedom is really just all about personal moral license joined to majority rule. Pick one. Moral “progressivism” is not freedom. It is rooted in anarchy. It is thought-policing. It is tyranny in bud, waiting for full flower. It is the enemy of freedom; and it will, inevitably, destroy all of our liberties. When presidential advisor John Podesta broad-brushes Americans of a different political party as Jonestown cultists, he merely shows his bias toward suppressive tyranny. Such hate-filled extremists are not public servants. They’re quacks. As for me, I’m with God, with objective reality, and with the founders of our country, thank you very much. I’d choose “Duck Dynasty” over “Quack Dynasty” any day of the week. I’m not agreeing with your assertion that Phil Robertson’s public statements somehow is about a “societal push towards gender anarchy,” whatever that is. And I don’t see this as a free speech issue considering Duck Dynasty is in its fifth season and has created a $400 million dollar empire in direct fees and merchandising. Not bad for a group of self-proclaimed Christian rednecks! Sadly, Phil’s response to the ruckus, which is much more aligned to the message of Christ, doesn’t seem to be getting much attention. He responded (in part), “I would never treat anyone with disrespect just because they are different from me. We are all created by the Almighty and like Him, I love all of humanity.” Had Phil been more thoughtful during his GQ interview, he might have been successful in disseminating that latter sentiment rather than becoming notorious for the former one. He inadvertently undermined his ability to preach the Christian message of love and compassion by crossing the line into hate-filled rhetoric, blaming the gays for the sins of the world. Now he is experiencing the consequences of having crossed that line. And that, to me has nothing to do with “gender anarchy,” whatever that is. Darrell – thank you for your thoughtful response. My point about gender anarchy is that it is the elephant in the room – we are either free to define ourselves by ourselves, or we’re not. The absolute root of the definition of sin, according to all historic Judeo-Christian thought, is self-determination – “No” to God’s ways, “Yes” to my ways – and if there’s a conflict between the two, then we choose our own way. If I were to cheat on my wife, by biblical standards, I have committed an act of self-determining rebellion – sexual anarchy, in this case. And it wouldn’t be “hate” to call me out on it. It is actually an act of love to tell me the truth, even when it hurts (assuming that there IS moral truth). The prophet Nathan hit King David right between the eyes (verbally) with a very harsh, offensive (and devastatingly true) accusation of adultery. It was a kindness from God to correct him. Hate would have been to let him go on uncorrected. To me it seems the root of the issue is even deeper than this. We have a huge section of our culture which believes that offending others is the greatest sin there is today. Just because people around me are offensive does not mean that I have to take offense at their words or actions. If I say it’s your responsibility not to offend me that’s basically admitting that I’m too immature to manage my own emotions so everyone around me must do it for me. The truth is your offensiveness can’t offend me unless I chose to take offense at it. Of course were that truth to grow in our culture it would make an entire industry built on victimization fade away. I don’t see that happening outside a major movement of God in our culture. Chris – yes, we see this head-scratching conundrum of intolerance (you and your beliefs offend me and that’s not allowed!) covering itself with the cloak of tolerance language (we’re all equal and you better not make any moral judgments). A truly free people can have passionately reasoned discussions and walk away with both disagreement and respect intact. So we should be tolerant of ignorant people who publicly disparage millions of others with ridiculous assertions (homosexuals have “no moral compass”, equating homosexuality to beastiality, proclaiming that blacks were happy before civil rights)? Sorry, but there are way too many ignorant people in the world who will believe that crap. It’s not about me being offended, but rather confronting and stopping that nonsense in its tracks. Hateful, disparaging statements, especially when wrapped in the self righteousness of religion, is a dangerous disease as we clearly saw in Nazi Germany and in the antebellum south.